The Bird’s-nest orchid is quite a little gem of a flower, and at the outset I want to thank a Forest of Dean naturalist Frank D Williams who put me on to this flower and helped me find it. This specimen was growing in the vicinity of the site Point Quarry in the Forest of Dean which is a bit off piste for this species. You will note that it has a single grasshopper on the top of the spike which coincidentally the Fly Orchid which I photographed yesterday also had. I wonder if I should adopt this grasshopper feature as a sort of trademark rather like the carpenter who always has a little carved mouse on his works…. maybe not. Anyway the first thing to note about this orchid is the colour or lack of it, in particular no green/chlorophyll. So in order to survive it has a relationship with a fungus. This is quite complex, I will attempt to explain. The fungus involved is called Sebacina and this fungus has a symbiotic relationship with certain trees often Beech. The fungus combines with the trees roots forming a mycorrhizal relationship. In this the fungus derives benefit in the form of sugars and other complex nutrients from the tree. The tree benefits from the fungus in that the fine threads of the fungus penetrate the soil and increase the capacity of the trees roots to absorb minerals from the soil. Many trees have a similar relationship with different fungi. Now what the Bird’s-nest Orchid does is to sort of gatecrash this partnership and its roots also combine with the mycorrhiza on the trees roots and it also takes in nutrients and water from the tree, but it does not give anything back in return. This makes it a parasite. You can see in this little photo a rudimentary leaf which is just a buff yellow colour as is the stalk. In fact Bird’s-nest Orchids do have a very small amount of chlorophyll, but not enough to give it any sort of green colour and also not enough to carry out photosynthesis and to produce sugars. Most orchids have a symbiotic relationship with soil fungi but this one has taken it a stage further and become totally parasitic. I said it was growing a bit off piste and by this I mean it is not often seen in the central area of the Forest of Dean. Frank D Williams says that this was the first time he had ever seen one growing in this part of Gloucestershire. Reference to the online atlas of British and Irish Flora tells us that the preferred pH for this species is 7 or neutral. 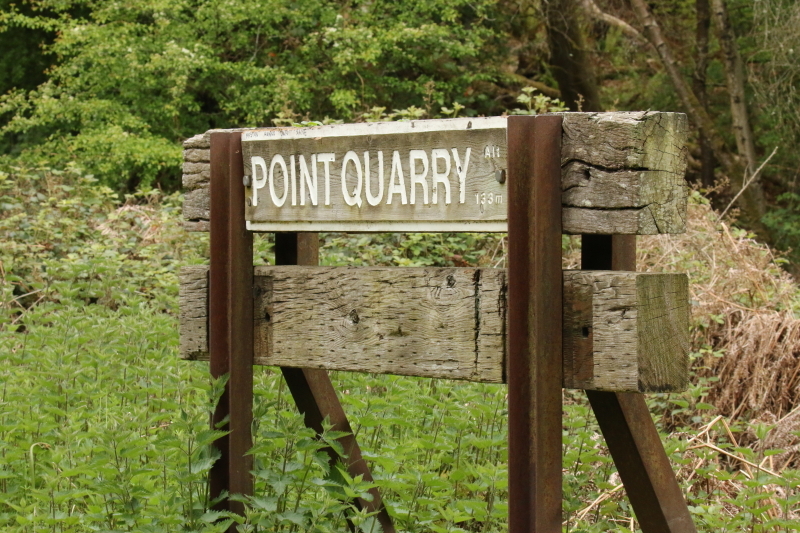 Now much of the Forest of Dean is acidic so that is probably why it is rarely seen here. Possibly the reason this specimen was growing here is because the cycle path close to where it was located had been made up with limestone gravel. The afore mentioned atlas does show that there are records for this orchid along the Wye valley north of Monmouth and in Symonds Yat area. 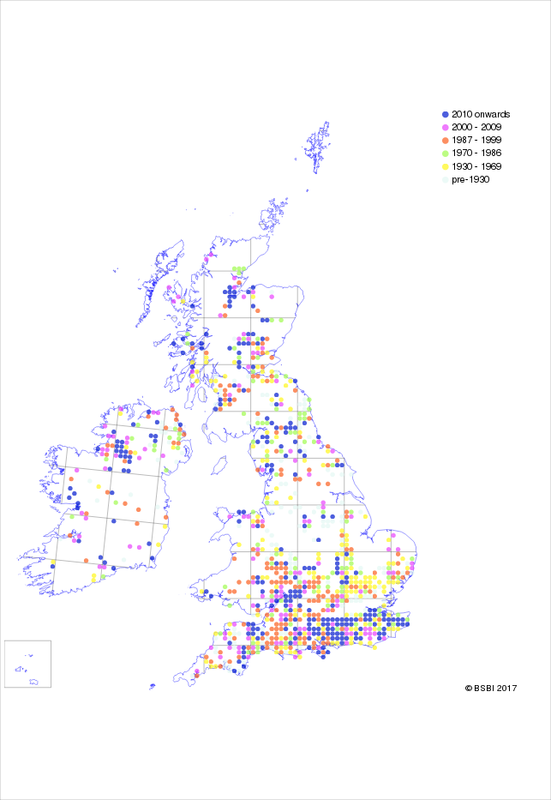 Indeed it is found throughout the UK but has declined recently, only the blue dots represent recent observations. I recently found a few specimens growing in Whitebrook which is a tributary of the river Wye and is a delightful but narrow road that follows the brook up from the Wye towards the villages of Penarth and the Narth. There are parts where you can follow the brook along a footpath and other regions where you have to resort to the road but there are not that many vehicles so you can stand and stare at the wild flowers and the fantastic houses and some old ruins. Having never seen a Birds Nest Orchid before last year, mostly because I lived in East Anglia and they are not so common there, I have now seen them yet again, making three locations in one year. This time they were in some woods near Staunton on the Monmouth to Gloucester road. Also this time there were about 50/60 of them growing quite close together in a loosely scattered patch. You may be wondering why it is called Birds Nest orchid, well this is because were you to dig it up, which of course would be totally illegal, then you would find the roots are matted together and somewhat reminiscent of a birds nest. 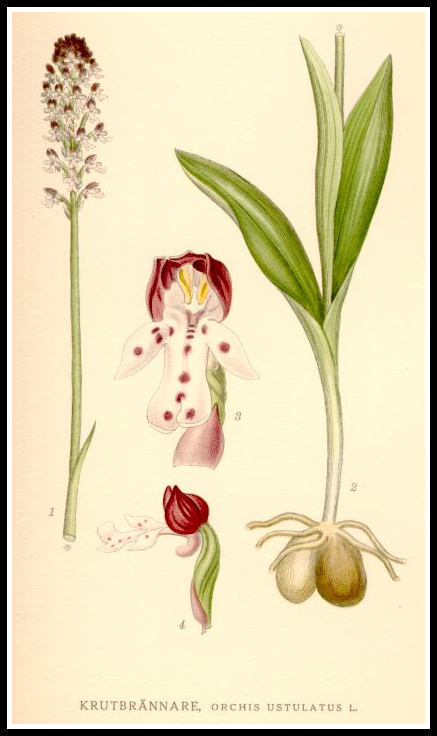 Incidentally the word orchid comes from the Greek word orkhis meaning testicles and this is because some orchids have swollen roots which resemble a pair of testicles! !.